The art of Tang Soo Do involves the development of the mind, body and spirit. 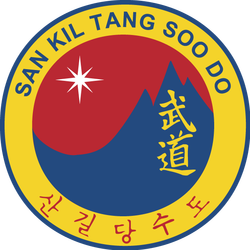 The three peaks in the San Kil Kwan Gi represent the three areas of development that we focus on in our training: Neh Gong (Internal Energy), Weh Gong (External Energy) and Shim Gong (Mental/Spiritual Energy). By facing physical, mental and spiritual challenges students will improve their well being and self awareness. The second highest peak represents Neh Gung and can be considered our breath or ki-hap during our technique. Neh Gong refers to internal body conditioning exercises most notably the correct use of breathing to control heart rate, blood pressure, adrenaline, and carbohydrate digestion. It involves changing the internal body energies by special concentration practices. It's purpose is to promote a healthier body by controlling metabolism through the concentration of energies to various parts of the internal body organs. Shim Gung is the highest peak and is our character; our attitude; our discipline (Moo Do). Shim Gong refers to spiritual conditioning exercises and challenges involving courage, concentration, endurance, honesty and humility. It involves control of your emotional being through a trust of self-confidence and positive thinking while striving for a high level of etiquette and respect (Yei) for others. It's purpose is to promote mind, body and spirit harmony through positive thinking and trust. When practicing in Tang Soo Do you are practicing a tried and true systematic and scientific method of training that enables you to realize your full potential. Through this system, each area builds on the next and is progressively more involved. Kwan Jang Nim has said that when the body has been tested and is tired (Weh Gong) the mind must take over. When the mind can no longer concentrate (Neh Gong) it is our spirit (Shim Gong) that is then put to the test. Tang Soo Do training promotes inner strength by constantly testing our mind, our body and our spirit. Our inner strength is something that can be cultivated just as we can improve stamina and physical prowess through regular exercise. A combination of all three aspects of training is important for the keen martial artist who wishes to progress beyond pure fitness.